I attended an all-included Disney press event for the Incredibles 2 film. Last year was my first time at Disneyland California when I was covering the history of the Pirates of the Caribbean ride and I am absolutely PSYCHED about Disney’s NEW plans for Pixar Pier at Disney California Adventure Park and the new food choices at Disneyland Resort in Anaheim California! Tie all of these new amazing Disney food eats below in with Disneyland’s Pixar Fest which runs from April 13-September 3, 2018 – that is one VERY giant Pixar celebration! It’s the BIGGEST theme park celebration of beloved stories and characters from Pixar Animation Studios! (IE – everything my kids watch!) It is coming to the Disneyland Resort (April 13 – Sept. 3, 2018) and features favorite Pixar pals, amazing delicious treats, and even new parade floats and fireworks! Check out my Pixar Fest post here for photos of the new Pixar celebration! WARNING: this post is FULL of amazing food photos, magical fun, and travel inspiring ideas. You might find yourself planning a trip to Disneyland after this post! 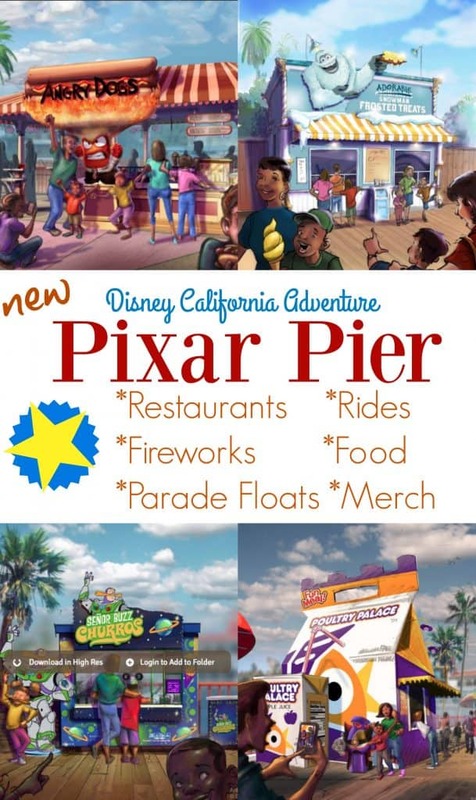 There are 4 specific Pixar themed restaurants & food stops coming to Pixar Pier! With an additional restaurant replacing the former Cove Bar location – all set to open June 23, 2018. Angry Dogs at Pixar Pier: This concept art is a glimpse at what the new Angry Dogs hot dog stand will look like – complete with spicy hot dogs! Poultry Palace at Pixar Pier: Chicken for everyone! Can you remember where Poultry Palace comes from? This artist concept illustrates the new stand at Disney California Adventure Park. Adorable Snowman Frosted Treats at Pixar Pier: Pretty sure this will be my husband’s #1 stop at Pixar Pier in Disney California Adventure Park! Senor Buzz Churros at Pixar Pier: Churros – do we need to say more?! Lamplight Lounge – I don’t have a photo for the new Lamplight Lounge restaurant but I CAN tell you that it will be where the current Cove Bar location is. Not technically a restaurant but keep your eyes peeled for Bing Bong’s Sweet Shop! I ADORE the new Pixar Fest Celebration Cake, inspired by the familiar yellow Pixar Ball, at Plaza Inn at Disneyland park and ALSO at Boardwalk Pizza & Pasta at Disney California Adventure park. Every kid is going to be “OOOOHHH AHHHH” over these Alien Macaroons in Tomorrowland at Disneyland park! This is healthy because there are berries in it right?! This delicious tempting Berry Funnel Cake is at Golden Horseshoe. Pretty sure my boys would be running for this one! It’s a Root Beer Float served in a Souvenir Woodys Boot at Golden Horseshoe. My personal favorite desserts always end with “funnel cake”! This Strawberry Funnel Cake is at my favorite Disney food stop – Hungry Bear Restaurant. Look at that brightly colored Strawberry Churro in Tomorrowland! Churros are some of my favorite family snacks for everyone to share and this Cocoa Churro can be found in Frontierland at Disneyland park. Get your greens! This Green Pesto Pasta is hiding in Tomorrowland! You can find this mouth watering Tuna Poke at Cove Bar. It’s currently at Cove Bar (March 16 to end of May) but the location is transforming to Lamplight Lounge (opening June 23, 2018) in Disney California Adventure park. Need a light breakfast? This Deviled Eggs and Toast platter is eye catching! It’s currently at Cove Bar (March 16 to end of May) but the location is transforming to Lamplight Lounge (opening June 23, 2018) in Disney California Adventure park. This Shrimp Ratatouille Byaldi at Café Orleans in Disneyland park is number one on my personal list to try – it looks AMAZING! If you’re looking for a specialty snack this Charcuterie Plate Starter can be found at Café Orleans in Disneyland park. OK I admit – Fried Bologna is NOT on everyone’s top list. BUT I heard straight from a friend at Pixar that this Fried Bologna sandwich is absolutely AMAZING (and she even hates bologna!). You can find this delicious sandwich at Carnation Café in Disneyland park. Last but certainly not least is this Pork Chop TV Dinner at the Carnation Café in Disneyland park. I don’t have a photo unfortunately but I’ve heard this impossible rumor about Color Changing Noodles! Send me a pic if you have one! After you’ve eaten all of this amazing food you’ll probably want to know a little bit more about the NEW Pixar Fest fireworks show, rides, parade floats AND even the exclusive Pixar Fest 2018 Trading Pin! Check out my new Pixar Fest Press Coverage post here! Headed north to San Francisco? You can’t miss The Walt Disney Family Museum here with scenic view tips you don’t want to miss! WOOT WOOT! Check out the Incredibles 2 Trailer – it’s coming to theaters on June 15th!!! !